Since our West Hollywood launch in 2006, we’ve delivered laser hair removal, anti-aging, tattoo removal, body contouring, and other state-of-the-art dermatological services to thousands of satisfied clients. Banish unwanted hair with Cynosure and Diode, the most advanced and effective lasers available. They work on all skin types and tones. Hit reset on all your body ink with the MedLite C Series and Harmony lasers. They work on all skin tones to remove even the most stubborn ink colors. The MedLite C Series and Harmony lasers also minimize the risk of complications that come with rapidly exploding ink pigments. An innovative, noninvasive procedure that uses controlled cooling to freeze and eliminate unwanted fat cells, CoolSculpting produces long-lasting, dramatic results. For most people, these results appear in as few as three weeks after their initial treatment. Thermage® uses radiofrequency technology to tighten, firm, and lift skin by stimulating collagen production. It can be used for facial contouring as well. Results achieved from just one Thermage® treatment can last years. The only FDA–cleared device that effectively and safely contours, shapes, and slims you, VelaShape® combines bipolar radiofrequency, infrared light energy, vacuum, and mechanical massage to smooth and reduce your skin’s surface. Clinical trials have shown that VelaShape® leads to a circumferential loss of up to three inches. It requires no recovery time. This means it fits perfectly into your active lifestyle. And you may see results after only one treatment. A revolutionary FDA–approved nonsurgical treatment, Botox® melts years away by temporarily smoothing lines found between the brows. It does so by reducing contractions of underlying brow muscles. A single Botox® treatment delivers benefits for up to four months. Similar to Botox, a revolutionary prescription medication that’s a great alternative to invasive cosmetic procedures, FDA-approved Xeomin provides similar benefits as Botox but at a lower cost. Juvéderm® smooths facial wrinkles and adds volume around the mouth. Juvederm can be injected into the lips to provide fullness. It uses hyaluronic acid, which occurs naturally in the body. FDA-approved Juvéderm® produces results that may last up to a year with only one treatment. Safe and effective for pretty much all skin types and tones, Juvéderm Voluma XC instantly adds natural-looking volume, creating contour, and lift. A revolutionary fractional laser procedure, Clear + Brilliant® rejuvenates skin from the inside out by resurfacing the top portions of your inner layer of skin (dermis). A single treatment may be all it takes to see pleasing results. Clear + Brilliant’s noninvasive laser technology gently resurfaces your skin’s outer layer (dermis) by creating millions of microscopic treatment sites. Clear + Brilliant acne scar removal will change your life! At these sites grow new collagen and healthier skin tissue. Clear + Brilliant’s patented Optimal Tracking System delivers treatment uniformly to all treated areas by ensuring that proper contact with the skin is maintained. Acne scars and discoloration are dramatically reduced. A unique, noninvasive skin procedure, photo facials use gentle pulsed light to improve the appearance of sun-distressed and mature skin. They also remove brown spots and wrinkle and shrink large pores. Plus, they stimulate collagen production for radiant, youthful skin. We at LaserAway offer the most service options of any national skincare provider. Our highly trained staff is experienced and certified in laser and other dermatological procedures. 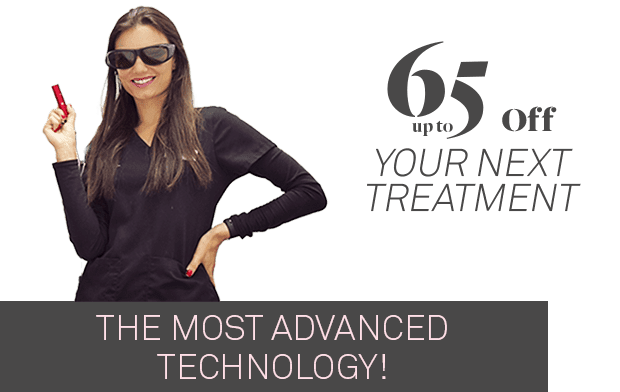 And we use only innovative techniques and cutting-edge laser technology in order to make your visit comfortable, enjoyable, and satisfying. Want to learn more about LaserAway’s many services and products? Then schedule a free, no-obligation consultation by emailing LaserAway.com or calling us at (888) 965-2737.